BREAKING: Can U.S. Elections Really Be Stolen? Yes. Is election theft possible in the United States? And might the suspects live closer to home than the Kremlin? Professor Mark Crispin Miller, author of numerous books and articles on computerized election fraud, explores the very real possibilities. Donald Trump is right to say that the election could be stolen. All our elections are vulnerable as confirmed by a Harvard University Study. We have the worst voting system in the developed world. The system is set to make honest elections virtually impossible. 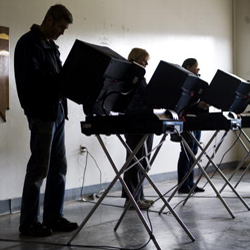 Election theft involves two steps: shrinking the pool of eligible voters. Second stage: Computerized election fraud involving manipulation. The system is both computerized and privatized. There is evidence that the Democratic primary was rigged as confirmed by a Stanford University study. The process of “Stealing an Election” has several dimensions which go well beyond election fraud and vote rigging.